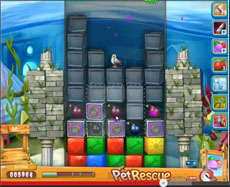 Pet rescue 445 seems quite difficult, as the screen is almost covered by metal boxes. The truth is that it is not. Start clear the blocks and when you stay out of moves use a balloon booster from that there are in the screen. As the screen scrolls down you ‘ll find some bombs in wires. Smash the wires and use the bombs to destroy the metal boxes (mainly) under the pet in the middle, as this is you target.